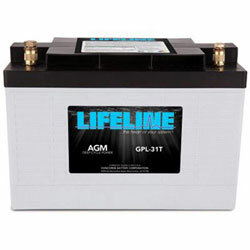 Lifeline AGM (absorbed glass mat) batteries, originally developed for Military Aircraft, are the premium sealed, maintenance free deep cycle battery available. Lifeline AGM batteries are more shock tolerant and have the fastest recharge rates due to their low resistance. They offer the best charge retention as well as twice as many discharge cycles as the leading gel battery.